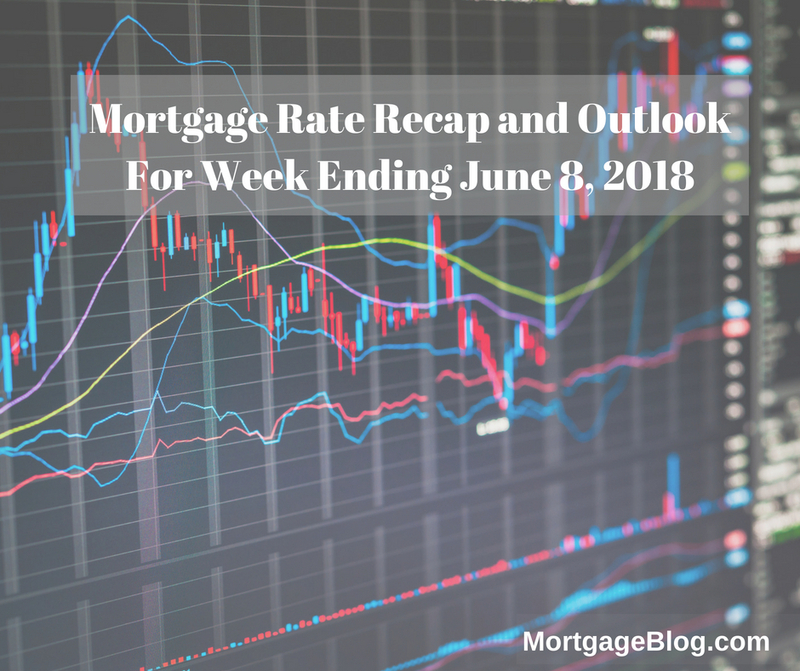 Without any geopolitical flare-ups over the last week, the impact of economic data has been very mild with no measurable effect on the markets or mortgage rates. The biggest job news was the filing of Jobless claims coming in slightly below predictions, but the 4-week moving average ticked up to 225,500 – amazingly low. Global economic news has also had little effect on mortgage rates, with continued talk of a timeline to end qualitative easing (QE) in the ECB the only topic of import. While the markets are quiet now, all eyes are on the meeting of the leaders of the seven industrialized nations (G7) beginning tomorrow in Toronto. In the last few days leading up to the meeting, there have been several ‘shots across the bow’ of potential pushback on several trade agreements and even retaliation against recent US protectionist economic policies. Even Putin is trying to ‘join the club’ with EU countries in calling out the US for perceived bullying tactics. The reality of what transpires in the G7 meetings and the impact it may have on the long-term bond market remains to be seen. 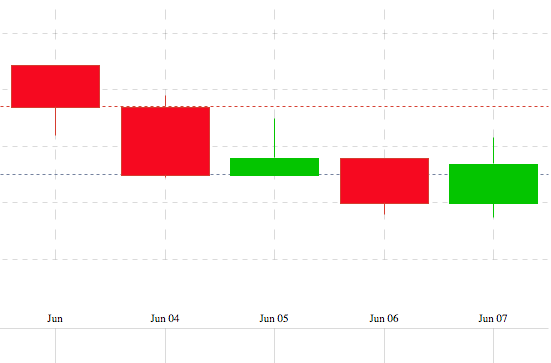 This candlestick chart below covers this weeks’ Mortgage Backed Securities (MBS) activity and the impact on interest rates. Rates improved slightly over this past week, although the candlestick chart shows more red than green. MBS directly impact mortgage rates, and the days with red indicate higher and green lower rates. This week’s Mortgage Banking Associations’ (MBA) weekly rate survey shows effective rates decreased for all loan products with an 80% loan-to-value. Bankrate’s weekly survey of mortgage and economic experts, countrywide, shows a majority (62%) predicting interest rates will increase this coming week (plus or minus two basis points), and 23% predicting a fall in rates next week. The remaining 15% predict rates will remain unchanged. 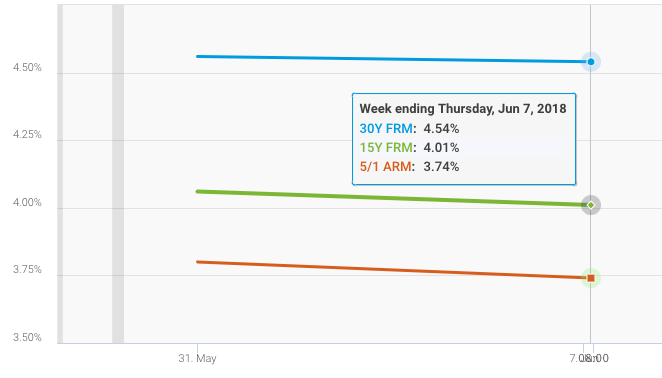 The chart below, from Freddie Mac’s weekly mortgage survey, shows conforming rates decreasing slightly over the last week, June 1st to June 7th, for 30Y fixed, 15Y fixed and the 5/1 ARM. In Freddie Mac’s weekly mortgage survey it was noted that “Mortgage rates dipped for the second consecutive week. Recommend locking in a rate now if you are purchasing or refinancing. There is not enough potential market improvement to support taking any risk in floating right now.